Le Thi Ha Giang, the representative of HCMUTE, won the coveted top prize of tis year’s contest. The runner-up was Cao Hoang Anh Uyen from the University of Social Sciences and Humanities (USSH). The third prizes were presented to Le Thi Tra My from Banking University and Dang Thi Hong Tham from USSH. 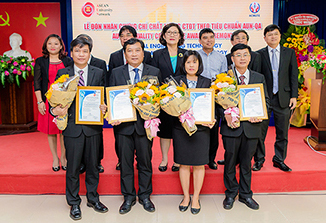 Student Mic 2018 was a competition organized by the MC Club of UTE which attracted over 200 contestants from Banking University, Nong Lam University, University of Technology, USSH, University of Economics and Laws, Thu Dau Mot University (Binh Duong), etc. and HCMUTE. Together with MC Thanh Phuong – beauty pageant titleholder of Miss Businessperson Idol 2017 was a team of professional and dedicated adjudicators who selected and provided feedback to orient and train the competitors . Those judges were MC Manh Quan, MC Kieu Oanh, MC Hai Trieu, MC Giang Tien, MC Chuc Linh, Runner-up of a male beauty pageant Ky Quoc Dat, Beauty pageant titleholder Thuy Anh, and speaker Le Van Hien. Student Mic 2018 and other academic skill contests to be held at UTE have created and will continue to create a playground for students hone their professional as well as essential soft skills for their future careers.